Here is an interesting update for Nepali cricket fans! 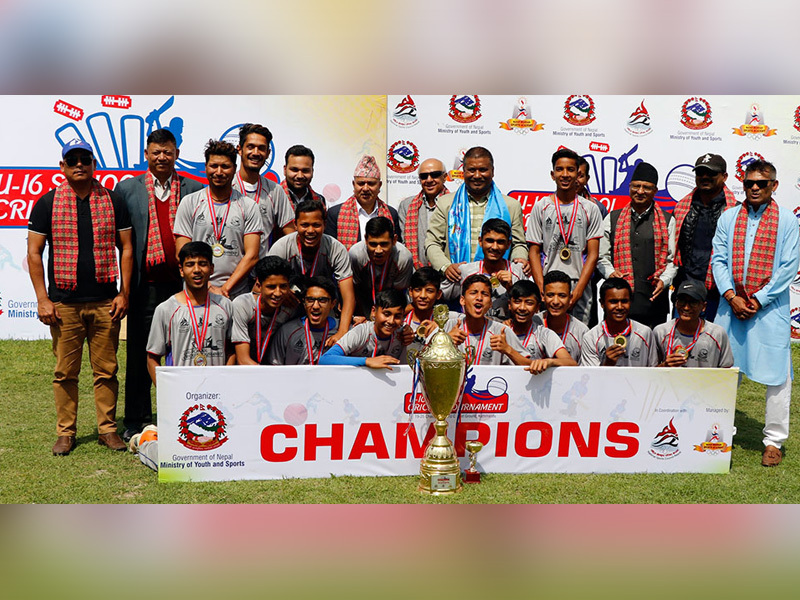 Province 3 emerged as the champion of the Nepal U-16 national cricket league that concluded at the Tribhuvan University cricket ground on April 08, 2019. In the last match of the tournament on the day, Province 3 won the toss to bat first. Despite a slow start followed by the loss of 3 wickets in just 37 runs, the team had to fight back to finally score 162 runs for the loss of 5 wickets in 30 overs. Bhattarai rescued the team by scoring 56 runs from 71 deliveries. He continued for a 58-run partnership with the fourth wicket. Mahat is another player who played crucial by scoring 34 runs from 32 deliveries. Abhishek Upadhaya’s half century and Prashant Mahat’s contribution stood crucial to Province 3 team’s score card. Province 5 team, who stepped in to bat, made a good start and continued with the amazing 61-run partnership of Bishal Bikram KC and Amar Mishra. However, Krish Karki of Province 3 gave a jolt to the Province 5 team by taking KC’s wicket, driving the latter to lose the match. Other bowlers of Province 3 team also did their best. While Bibek Darai and Deepak Bohora shared two wickets each, Sakriya Karki and Tilak Bhandari managed with one wicket, each. Overall, Province 3’s Ayees Bhattarai and Province 5’s Ramesh Kurmi have been declared as the Best Batsman and Best Bowler, respectively. While, Province 4’s Arjun Kumal was named for the Emerging Player of the tournament category. A total of 7 provinces participated in this tournament organized by the Youth and Sports Ministry in coordination with National Sports Council.